The economy Intercomp ACII-7.5K system enables you to justify purchasing an ultra efficient scale system versus outsourcing the work to an expensive independent contracted weighing service. This weigh system consists of three ultralight platform scales and is connected to the ACII Digital Indicator. The large LCD screen allows you to display each platform and sums the total weight. Other push button controls include on/off, percentage of weight and zero. All of the models weigh less than 150 lbs, which gives you the ultimate in portability and affordability. 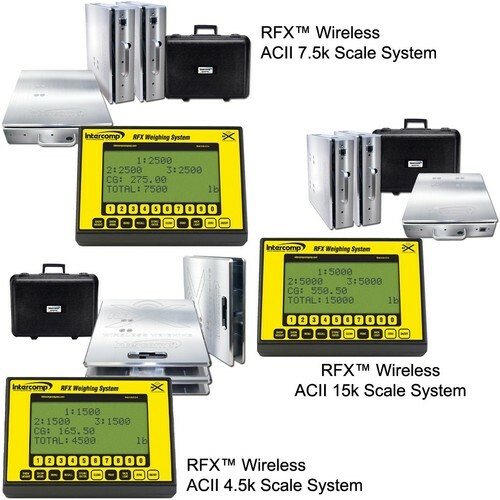 Fully Integrated RFX Wireless Weighing Technology! Low cost, yet reliable, scale system available to operators for weighing light aircraft to determine center of gravity. This economy model enables you to justify purchasing an ultra efficient scale system versus outsourcing the work to an independent weighing service. The ACII is built from Intercomps fully electronic scale technology. Intercomp has supplied this technology to the worlds major airlines, manufactures, maintenance centers and military branches. This system consists of three ultralight platform scales and RFX Wireless Handheld Indicator. The large LCD screen on the Indicator allows you to display each platform and total weight as well as fully control scale functions. The ACII operates on standard AA Batteries that last up to 300 Hours in the Scales and 40 Hours in the Indicator. Systems are available in 4,500 lb (2,200 kg), 7,500 lb (3,400 kg) and 15,000 lb (6,800 kg) capacities.